Unfortunately, due to sales rights restrictions, we cannot offer Secret Channel To Berlin for sale in your country. During World War II Switzerland was famous as a centre of spies and espionage fielded by the Allies and Axis alike. Less has been known, however, about Switzerland's own intelligence activities, including its secret sources in Hitler's councils and its counterespionage program at home. With this intensely researched, scholarly, yet exciting book, that gap in the history of wartime intelligence operations has been filled. only Swiss intelligence operation during the war. 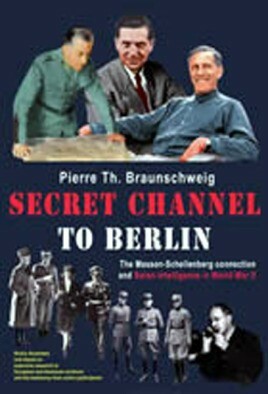 Braunschweig outlines in detail the gradual build-up, tasks and functions of Swiss Intelligence during World War II. Furthermore, he describes conflicts between Swiss Intelligence and the Federal government in Bern and within the Intelligence service itself. PIERRE-TH. BRAUNSCHWEIG earned a Ph.D. in history from the University of Bern and later served as an assistant to Hans Senn, the Chief of Staff of the Swiss Army. He is a member of the United States Strategic Institute in Washinton DC, the International Institute for Strategic Studies in London, and the National Intelligence Study Center in Washington.